Legend has it that Rome was founded in 753 B.C.E. by Romulus, its first king. In 509 B.C.E. Rome became a republic ruled by the Senate (wealthy landowners and elders) and the Roman people. During the 450 years of the republic Rome conquered the rest of Italy and then expanded into France, Spain, Turkey, North Africa and Greece. Rome became very Greek influenced or “Hellenized,” and the city was filled with Greek architecture, literature, statues, wall-paintings, mosaics, pottery and glass. But with Greek culture came Greek gold, and generals and senators fought over this new wealth. The Republic collapsed in civil war and the Roman empire began. In 31 B.C.E. Octavian, the adopted son of Julius Caesar, defeated Cleopatra and Mark Antony at Actium. This brought the last civil war of the republic to an end. Although it was hoped by many that the republic could be restored, it soon became clear that a new political system was forming: the emperor became the focus of the empire and its people. Although, in theory, Augustus (as Octavian became known) was only the first citizen and ruled by consent of the Senate, he was in fact the empire’s supreme authority. As emperor he could pass his powers to the heir he decreed and was a king in all but name. The empire, as it could now be called, enjoyed unparalleled prosperity as the network of cities boomed, and goods, people and ideas moved freely by land and sea. Many of the masterpieces associated with Roman art, such as the mosaics and wall paintings of Pompeii, gold and silver tableware, and glass, including the Portland Vase, were created in this period. The empire ushered in an economic and social revolution that changed the face of the Roman world: service to the empire and the emperor, not just birth and social status, became the key to advancement. Successive emperors, such as Tiberius and Claudius, expanded Rome’s territory. By the time of the emperor Trajan, in the late first century C.E., the Roman empire, with about fifty million inhabitants, encompassed the whole of the Mediterranean, Britain, much of northern and central Europe and the Near East. Starting with Augustus in 27 B.C.E., the emperors ruled for five hundred years. They expanded Rome’s territory and by about 200 C.E., their vast empire stretched from Syria to Spain and from Britain to Egypt. Networks of roads connected rich and vibrant cities, filled with beautiful public buildings. 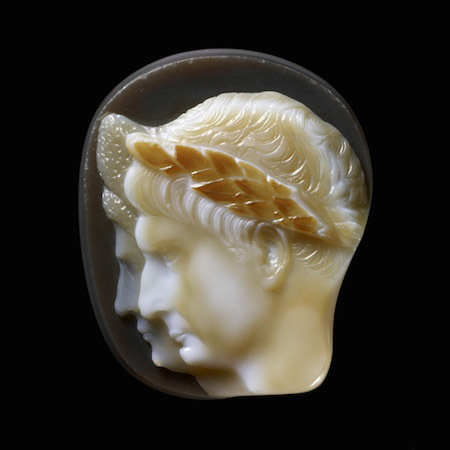 A shared Greco-Roman culture linked people, goods and ideas. The imperial system of the Roman Empire depended heavily on the personality and standing of the emperor himself. The reigns of weak or unpopular emperors often ended in bloodshed at Rome and chaos throughout the empire as a whole. In the third century C.E. the very existence of the empire was threatened by a combination of economic crisis, weak and short-lived emperors and usurpers (and the violent civil wars between their rival supporting armies), and massive barbarian penetration into Roman territory. Relative stability was re-established in the fourth century C.E., through the emperor Diocletian’s division of the empire. The empire was divided into eastern and western halves and then into more easily administered units. Although some later emperors such as Constantine ruled the whole empire, the division between east and west became more marked as time passed. Financial pressures, urban decline, underpaid troops and consequently overstretched frontiers – all of these finally caused the collapse of the western empire under waves of barbarian incursions in the early fifth century C.E. The last western emperor, Romulus Augustus, was deposed in 476 C.E., though the empire in the east, centered on Byzantium (Constantinople), continued until the fifteenth century. Cite this page as: The British Museum, "Introduction to ancient Rome," in Smarthistory, March 1, 2017, accessed April 21, 2019, https://smarthistory.org/introduction-to-ancient-rome/.